Hive or multigenerational homes are becoming the new norm where once they were an anomaly or really heard of. This type of residential property is sold with a separate cottage or ADU (accessory dwelling unit) and is perfect for an office, a mother-in-law, or simply have another living space on the property. For both economic and security reasons, households made up of several generations on the rise, especially in places like Palm Desert, Palm Springs, and Southern California. With parents and children or grandparents pulling the resources to buy residential property to accommodate all. Whether it's millennial's taking the extra ADU or aging parents, this type of living situation is becoming more popular. This could be because of the declining affordability, economic status, or the difficulty in coming up with a down payment for millennial's. 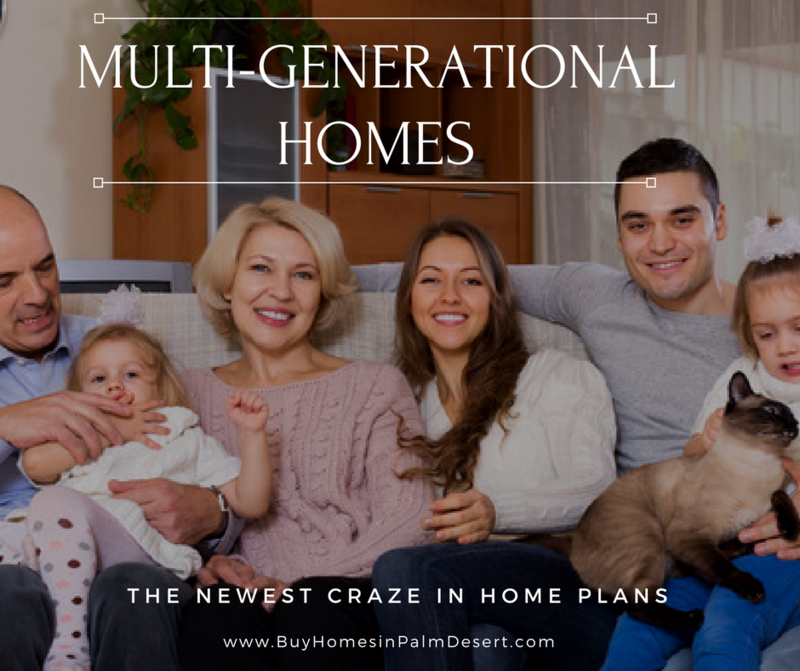 There are a lot of different options when it comes to multigenerational homes. Whether it's a studio above the garage or a complete and separate building on the same property, the options are really endless. Lennar and Stanton Homes are just two of the more popular homebuilders in America designing these multigenerational homes with a complete attached home separated from the rest of the house only by what is meant to be an internal front door. Many of these places have wheelchair access, open concept kitchens and a general living space with a separate bedroom and bathroom. The cottage style apartment is becoming a popular option. Alan Mascord designs a beautiful multigenerational home plan with an apartment-style living space completely separate from the main dwelling. It offers a private vaulted living room, kitchen, and bathroom, typically separated by the garage. Two master bedrooms per home are also becoming a common household option. There may be a master bedroom on the main floor or ground floor with an additional master bedroom on the second story. You can also have complete living quarters in a downstairs or basement. Obviously, the reasons and uses are endless but if you're looking for a multi-generational or HIVE home, contact me today. There are some great options around the area and I'd be happy to send you a list of current and active properties for sale.